Voice of the Collector: Tiger, Brian Kelley, Upper Deck's Holiday Hunt and more! Tiger, Brian Kelley, Upper Deck's Holiday Hunt and more! Tiger Woods- I was really glad to hear that Tiger is stepping away from golf to focus on the only things in life that really matter . . . family. A look at some of the woman Tiger has been alleged to have cheated on his wife with, just makes you ask, "Why? What were you thinking." 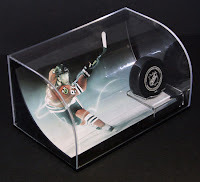 Upper Deck Authenticated Hockey- Capitalizing on the success of it's very cool (yet pricey) line of UDA signed memorabilia pieces, they are launching a new line of hockey collectibles. You can see more of the framed pieces here. They are even looking for feedback as this was posted on their blog and not a press release. UD continues to engage with collectors like no other company. Upper Deck Holiday Hunt- If you haven't heard, Upper Deck will be having a Holiday Hunt starting next week on its Facebook Fan Page. They have some great prizes, and I mean GREAT. Joe DiMaggio Cut Auto, Lebron James UDA signed basketball just to name a few. See some of the other prizes. eTopps- Is holding a "town hall" meeting of sorts. According to their website, "As part of our effort to engage and connect with our community . . . yadda . . . yadda." Full details including dates, times, phone in and access code numbers are available thru the link. **NOTE** 1st 100 callers only.